Recognizing employees is the most critical thing a manager can do to improve performance and inspire employees to drive results for business success. It’s important for organizations to deliver frequent feedback using employee recognition, yet many managers have not adopted this practice into their daily equation. Understand why managers don’t use employee recognition and how to get them to start. 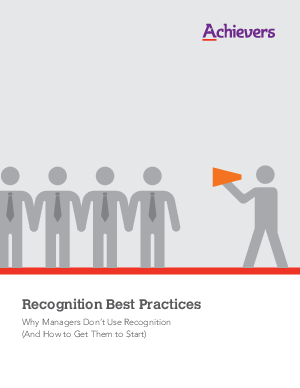 This white paper, Recognition Best Practices: Why Managers Don’t Use Recognition (And How to Get Them to Start), discusses the top reasons given by managers who have yet to adopt employee recognition, which include a lack of time and resources to recognize everyone fairly. It also reveals the benefits for managers to adopt employee recognition into their everyday behavior. Read this white paper to understand how employee recognition can help managers inspire employees to drive business results for your organization.